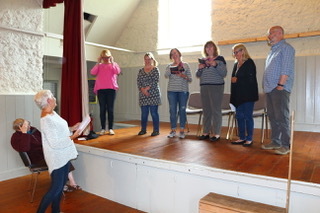 Halse Players are pleased to fundraise for Walk the Walk breast cancer charity with contributions from this production. Eight years ago, Halse Players was born with the pantomime, Cinderella and the Forty Thieves in the Wood. Anyone who saw it, and anyone who was in it, will always remember the sheer fun it was, but it would be hard to envisage that, from such a beginning we would have grown into the group which now forms Halse Players. 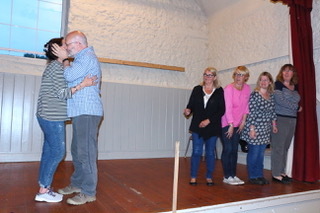 Over the years we have put on just short of 20 productions, with casts ranging from one (Shirley Valentine) to almost too many to count (Mini-Musicals). Elaborate sets have been constructed: three different kitchens in Absurd Person Singular; three different rooms for Pack of Lies. New people have been roped in either to act or to put in time backstage for pretty much every production some have even returned to perform more than once! Audiences have been loyal turning out in the snow and ice and rain to be entertained. And the reputation of the Players is growing - as well as support from Halse itself, we are increasingly drawing audiences from the surrounding villages and Taunton. 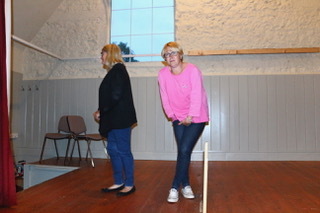 A lot of time and work goes into putting on a play: learning lines; learning moves; making costumes; sourcing props and furniture; designing and constructing sets; producing programmes; advertising - it's a long list. But along the way we have a lot of fun and laughter, and experience a genuine sense of loss when each production is over and the set packed away. If anyone is interested in joining us, please do get in contact We'd be glad to have you. Follow the hilarious adventures of a group of women taking part in the breast cancer charity Moonwalk. 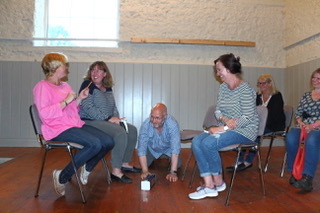 There is bossy Hilary, flirty Vicky, disillusioned Yvonne, supportive Siohban and uncertain newcomer Maggie. And when new mum Chloe has to drop out, the last minute replacement causes ructions!